I've updated the diagram to reflect the latest changes in the RF paths / equipment. The main change is the way the output power is measured. In the new configuration I am using one watt-meter for output-to-antenna power and another watt-meter for the output-to-dummy load power. In the old configuration, each amplifier had its own dedicated watt-meter for the output. In addition, the main high-power dummy load is now an oil-filled Bird 8201. My name is Joe, call sign WA3UVP, home QTH Danville, Pa. Great blog site. Enjoyed each of your posts, especially like the graphics on the your Shacks RF signal path diagram. What software did you use to design the diagram, very well done. The software I used to create the graphic is Corel Draw Ver.12 (http://en.wikipedia.org/wiki/CorelDRAW). This software package is for professional graphic design work (I used to work as graphic designer years ago). It works with vector-based graphics and it is very similar to Adobe Illustrator. It took me less than one hour to create the diagram, mostly because of my expert level knowledge and years of experience with Corel Draw. For somebody with no prior experience whatsoever in graphic design it might not be as easy and quick - this software is not intended to be a specialized schematic editor (as Microsoft Visio is) but more of a universal tool for graphic design. Hope this helps! Ok, thanks for the up-date and information on the use of Corel Draw to do your graphics. As soon as I saw the diagram and the very professional appearence, I was sure you had some time as a graphics designer. I'm looking for some type of software, simple to use, hopefully, to do some basic design diagrams. Again, many thanks, and nice job on the Blog site, enjoyed your articles as well as the photos. 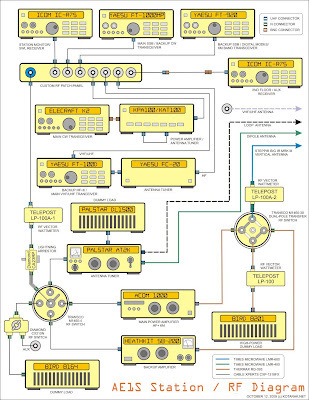 I would like to try to draw my own station diagram using your graphics. 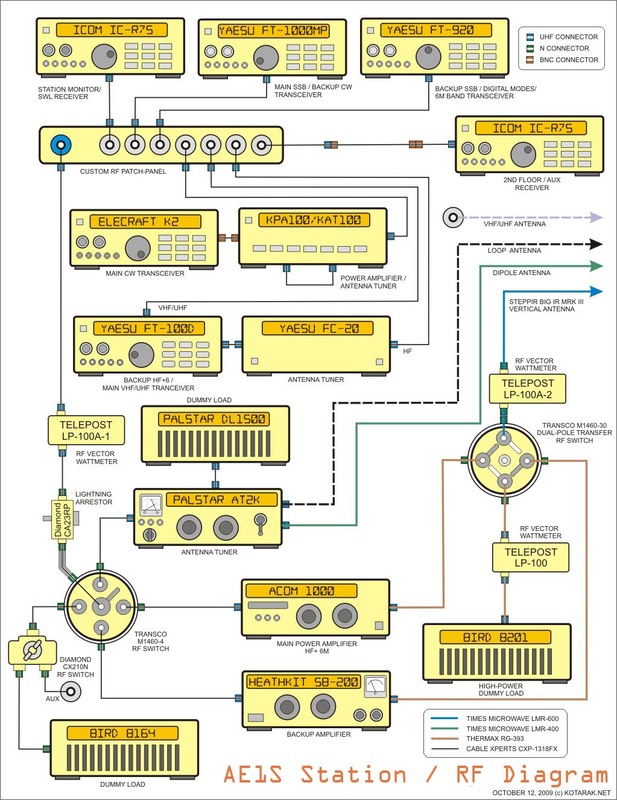 Is it possible to copy your graphics (transceiver, amp...) ? Could you please tell me the name of the fonts you used ? Sure! Go ahead and use the graphics. The fonts I have used are Ariel and Digital Dream Fat. Very complicated diagram. If you are looking for a good chart positions or presentations advise to look this source http://charts.poweredtemplate.com/powerpoint-diagrams-charts/index.html. Here you will find a lot of different patterns that you like.